Once WPML is setup and configured to work with The Events Calendar, you can show your calendar in different languages. This article reviews some important tips for using the two plugins together. This article assumes some familiarity with using WPML. If you are new to WPML, you'll want to review their Getting Started Guide before moving on to translating events. When viewing the Events within your WordPress dashboard, you'll now see the additional column for managing the translations. 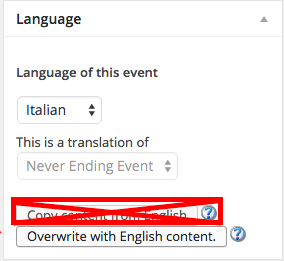 Just like when you're creating translations for your posts or your pages, you can use any of the "+" signs to create the related translation for your events. You MUST start by overwriting the content with the content from the original event.This will cause not only the content to be migrated, but all of the event meta as well. If this doesn't happen, your translated event will not have the same date, time, venue, etc. as the original event, causing it to act like a completely separate event within your calendar. When overwriting, NEVER use the "Copy content from English" option. Always use the "Overwrite with English content"
The point of overwriting the content is to ensure that the events will be an exact duplicate, so they display properly on your calendar. The problem with using the "Copy" option is that none of the event meta will be copied over to your translated event. This will cause numerous problems including translated events showing up on the wrong days. Make sure you hit the "Translate independently" button right after step 2. If you don't, any changes made in the translated language will result in changes on the original language as well. After hitting that button, you might want to modify the title of the event and its permalink. There are still a few glitches in place when it comes to the interaction between our plugins and WPML with Venues and Organizers. Organizer and Venue: Creating a new venue or a new organizer at the same time you are creating an event with WPML will result in the newly created venue or organizer to not be assigned a language for technical reasons. We recommend not doing that for now. 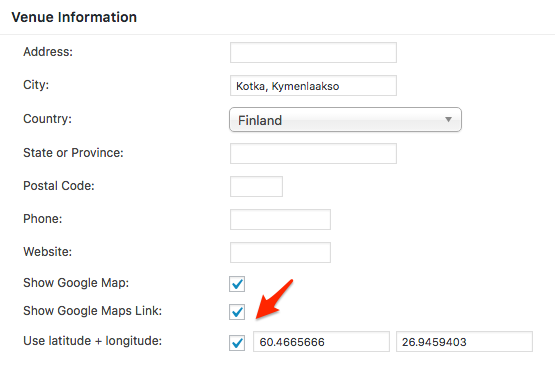 Venue: Sometimes the Google map related to a venue might not display in alternate languages in the single event view. This issue only affects certain WordPress themes. Organizer and Venue: Create Venues & Organizers and all of their translations preferably before creating events. You can also create them after, but that will require going back in each event in all languages and manually assigning the Organizer and Venue. Starting with version 4.3, our Events Calendar Pro users finally have support for recurring events while using WPML. Create your event and recurrence rules in the site's main language. Follow the 4 Essential steps above (pay special attention to step 4) for dealing with translations of those recurring events. Make sure you have read about our issues with Venues and organizers. Very important: in spite of the "You can safely navigate away" message, it is important that you do not switch language until the event series has been fully created. Otherwise, some of the recurring events will be created in the language you have switched to. There are many options available to you when using the WPML plugin. This can be a great thing when it comes to customizing that feature for your site. 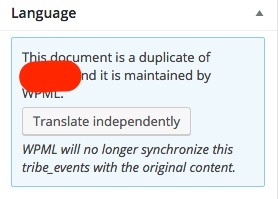 However, this does create a few problems with compatibility since we're unable to comply with every option that is available within the WPML plugin. You may find that using certain settings may cause your calendar and associated events to behave in strange ways that you do not like. If you notice any strange behavior when using these plugins together, you can post to our help desk, and we will do our best to help--or add the issue to our list of things to work on.